Everyone needs a villain. Everyone needs a narrative. This has always been the case, but in our so-called “post-truth” era it’s become that much easier to create a vision of American history that aligns with all of one’s particular beliefs and biases. Take, for example, the tendency among Trump supports to define their president almost exclusively as not-Barack Obama. When people criticized Donald Trump’s behavior before and during Hurricane Harvey—fawning over its size while “thanking” (?) flood victims, bellowing about the “turnout” while standing atop a fire truck, pardoning a famously racist sheriff for ratings, and, of course, bitching about the media—his supporters bolted to the Obama well to remind the Dems about how badly Obama bungled his response to Hurricane Katrina. So desperate for a villain, these people (and bots) are saying “Thanks, Obama” for a hurricane that happened three years before he was elected president. And this isn’t just a small contingent, either. So widespread was this completely Google-able misconception that Snopes needed to publish a piece refuting it. 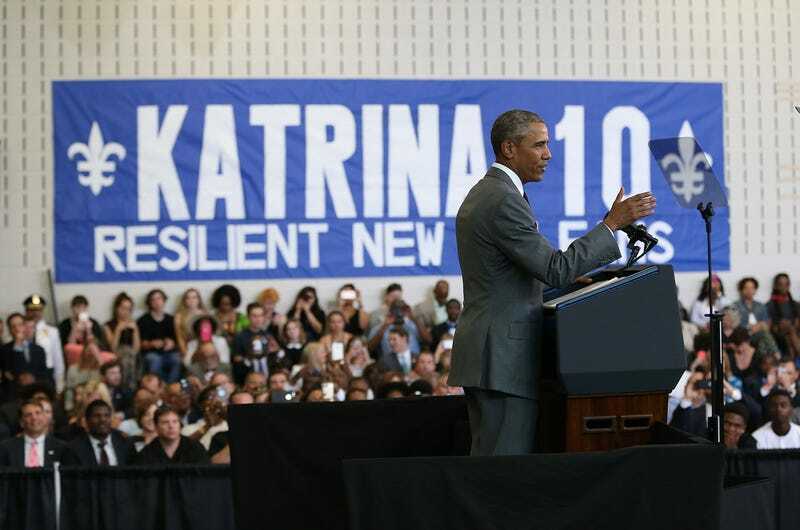 Obama, then a senator, actually did visit with Hurricane Katrina evacuees. He also toured the devastated areas, something our current president neglected to do, what with him being “very cautious about making sure that any activity doesn’t disrupt any of the recovery efforts that are still ongoing.” He is much more comfortable in his homebase of Twitter, where pretty much nothing is real.